"I'm always going to sing. That's the end of it. I'm going to sing until I die." Cyndi Lauper chronicles her life and career in this candid memoir; she holds nothing back. And her journey has not been an easy one. She left home at seventeen. Failed out of school. Got and lost a myriad of low-paying jobs. And struggled to find her voice in a male-dominated music world. Dealing with her success and fame has not always been easy either. Her narrative does tend to go off on tangents at times--MANY tangents--but overall this is a fascinating look at her life. Lauper is VERY outspoken, sometimes to her detriment. (She swears a lot, too.) She's also uncompromising when it comes to her music, and always, unapologetically herself. "If life is for learning, then we all better get to know our book...And remember this: It's not what others think about you that will allow you to succeed. It's what you think about you that allows you to succeed. Because if you can picture yourself doing something, don't listen to anybody who tells you that you can't. You have to just try. Otherwise you're gonna be saying should've, could've, would've, and you don't want to be saying that in your life." She's certainly led an interesting life! Wow, sounds like Lauper's had an interesting life! I'm glad you found her memoir a worthwhile read. I feel like her life has been one crazy adventure after another. She's very idealistic, which is kind of appealing. I hadn't realized she had written a memoir. I'll have to check it out. She's always fascinated me and is still amazing so many years later rocking her pink hair. This looks like a fascinating read. Cyndi Lauper is one of those people I find really interesting. Also, thanks for the album recommendations! Ah Cyndi! I wouldn't expect anything other than a candid memoir from her. She has always seemed like such a down to earth person. I thinks my favorite song by her is "I Drove All Night". Her vocal range is pretty incredible (and much better than that of Madonna - no shade on Madge but her voice is not that remarkable). "I Drove All Night" is a great song! I like that one, too. I like Cindi Lauper too, very talented. I'm thinking this might be a good book in particular for young people and by that I mean people in their late teens early 20's because its there that you begin planning your life and Cindi's book sounds like she has alot of hard earned lessons particularly for the young and following your dreams. Sounds like an interesting read. I know virtually nothing about Lauper. I didn't either. Her music has gotten a lot of press, but not her life. I liked Cyndi Lauper from the minute I first heard her--there's something very honest about what she does. Yes! And she's VERY honest about who she is, and about her life, and her mistakes, and her hopes and dreams. Which makes for an interesting autobiography. I grew up listening to Cyndi Lauper, and am a fan of much of her earlier work. This sounds really interesting. I actually don't know much about her as a person. I will have to add this to my wish list. I was never really a fan of her music to be honest. I was more into rock and the New Romantics! I never owned any of her albums, but I liked several of her songs, and I always thought she seemed like a fun person to hang out with. 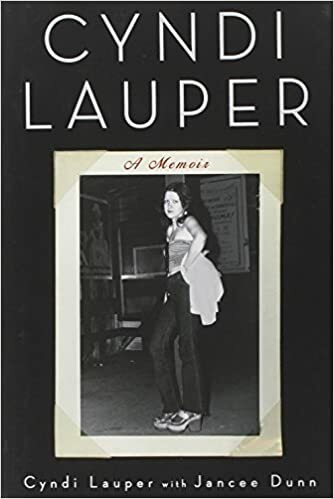 I don't read a lot of memoirs but somehow I think I might enjoy this one because it would be a bit nostalgic for me to remember all of her 80s hits! Oh, wow. I need to read this.